Oh, why couldn't I have been born ten years ago? 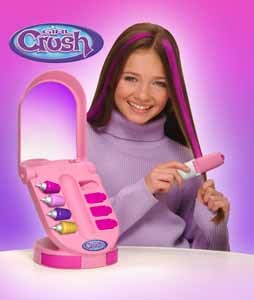 Every time I review another Girl Crush toy I wish that I could be a teenager again. To be honest I hated it the first time around, but then there was nothing as cool on the market as this. So what do you get for £20 these days? A lot, surprisingly. You get the tongs, four different colours (moonstone silver, sugar pink, hot pink and cool blue), design pads, a comb and a case that houses everything and even comes equipped with a mirror. As you can imagine, as a woman in my 30's, I was a little apprehensive about reviewing this in the office. You know what it's like - we have our office joker too. And I wouldn't put it past a certain editor to replace the colours provided with permanent dyes [The very idea! - Ed]. So, I took this home and had great fun streaking my hair all sorts of colours - safe in the knowledge that I could wash it all out once I'd finished. It's relatively easy to use, and really simple to get some great looking effects. The perfect gift to buy for a young girl who is just starting to care about her appearance. It also makes the perfect addition to a slumber party, if you've already got the other items in the Girl Crush range. Other stockist of this item include: Woolworths and all good toy shops.